A little-known subsection of Oakland called Bushrod, next to Temescal and on the Berkeley border west of Telegraph Avenue, was named by real estate site Redfin as the number one "hottest neighborhood of 2017," the first time that an Oakland neighborhood has made one of the site's "hottest" lists. They cite "soaring demand in late 2016" particularly from San Francisco couples who had been renting in SF and looking to buy in Oakland or Berkeley. Locals from the last decade may recall that Bushrod Park, the centerpiece of this neighborhood, was the site of a crazy crash landing of a large chunk of ice on April 8, 2006, spraying dirt into the air and leaving a three-foot-wide crater in the grass. The ice was determined not to be the dreaded "blue ice" that sometimes becomes dislodged from commercial airplane lavatories, but it was baffling and freaky to nearby residents, at least one of whom took a chunk home to put in his freezer, as he told the Chronicle. The source of the ice remains a mystery to this day, with one FAA official suggesting to the East Bay Times at the time that it could have been tossed from a small plane passing overhead  and witnesses did say a plane passed by near the time of impact. 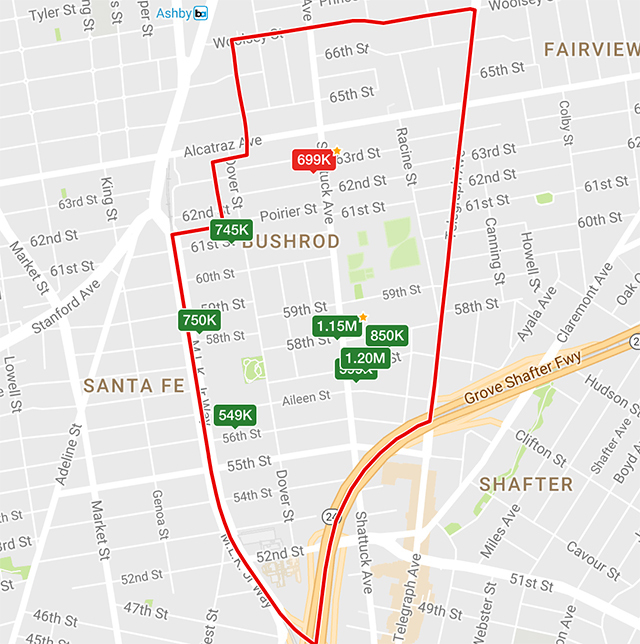 As for the hottest neighborhoods for home sales in San Francisco this year, Redfin is predicting those will be Visitacion Valley, Excelsior, and the Inner Richmond. Real estate agent Miriam Westberg says, "Viz Valley’s hotness is no surprise for one simple reason: it is one of the last places within the city limits of San Francisco where you can still buy a single-family home for less than a million dollars." She also notes its proximity to freeways for Peninsula commuters, and the proximity of McLaren Park. "The best part about it is that you can actually enjoy being outdoors more often here since its southerly location means Karl the Fog doesn’t really hang out here that often," Westberg adds. Among the top five hottest neighborhood around the country, besides Oakland's Bushrod, are one other Bay Area 'hood, Serra in Sunnyvale, where homes spend an average of 13 days on the market; Woodridge in Bellevue, WA, outside Seattle; Somerset in Glendale, CA, near LA; and Portland's Eliot, in the NE quadrant of the city.